Booked: Nancy Herrington will target literacy. Nancy Herrington was exhausted. After a bout of cancer and 15 years as a software consultant, she was ready for a challenge that would keep her near her Phoenix-area home. A good friend in Dallas had bought a Mr. Handyman franchise and kept badgering Herrington to look into the business. When she finally did and studied her local demographics, she knew it would be a great fit. "I keep telling people I am my customer--my business does the types of projects I can't do or don't know how to do," she says. "Now I'm using the talents of the guys that work for me." But it takes a special kind of handyman to work for Herrington. Not only does she look for employees with exceptional customer service skills, she also looks for staff who share her major passion in life--volunteerism. 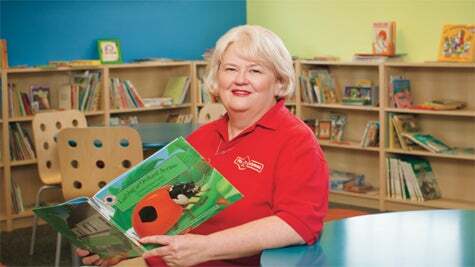 Since opening her franchise in 2008, Herrington and her staff have run home maintenance workshops at a local women's shelter and for Habitat for Humanity; they've spearheaded river cleanups; done repair work for local Boys and Girls Clubs; and organized the annual Let's Make a Difference Day, during which local small businesses come together to rehab homes for disabled veterans. All this won her a Heart of Volunteerism award from a local volunteer network, and Herrington has remained committed to the community even when her company's survival was in doubt. "In 2009, we were wondering how we were going to make it through 2010," she says. Nevertheless, business last year was up 85 percent from 2009, she says. "I was supported by family and by employees who stuck with me and made a lot of sacrifices themselves." What got you into volunteerism? Having cancer definitely influenced my decision. I lived my whole life doing what was right for me, then when I found out I had Stage 4 colon cancer, I thought, "OK, God, I'm not making the best plans. What do you want me to do?" Volunteerism is a mission for me. We can make lives better by offering great service and donating time. How do your employees feel about volunteering? During our downtime, for every two volunteer hours they work, I pay them for one hour. But they like volunteering on their own, too. Through the interview process I can see if an employee will be a good match, and we usually know within two or three weeks whether they will be a great cultural fit. Why mix volunteerism with business? I like to buy from businesses that give back, and I think my customers do, too. We send out an e-newsletter about our volunteerism and get great feedback. I try to do as much as I can without being judged for tooting my own horn. I like to think we're not just giving back, we're also helping people to help themselves. For instance, our classes at the domestic shelter give people basic skills. Do you have plans to expand your volunteer efforts? There are three projects I want to focus on. First, I want to develop a once-a-month program to highlight an outstanding community volunteer and recognize them with free Mr. Handyman services. Then I want to expand Make a Difference Day and get 10 other small businesses to help us identify projects and to donate money. In 2009, we refurbished the homes of two disabled vets. We want to do 10 homes per year. I also want to do something with literacy. I think having a literate community is a strong base for everything else. Are you a handyman now? I've actually gotten smarter. Yesterday, I put on a new shower head. That would have taken me all day before I started this business.